Send your get well soon wishes with a unique after surgery gift from CareGifting. Help that special someone feel better soon with gifts that comfort, heal and show that you are thinking about them during their recovery. This is the best gift to send to someone who is recovering after a surgery, has chronic aches and pains, arthritis, post-op surgery, a pulled muscle or sports related injury. When pain and inflammation are causing them heartache send a gift basket that will help with healing and make them happy! 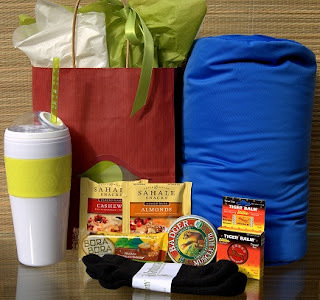 Our After Surgery-Sport Gift Basket offers exceptional items that will ease their pain and make them feel more comfortable. - Sore Muscle Rub, Athletes rave about these balms, great for soothing sore muscles and achy joints. Badger's natural sore muscle rub is infused with extracts of ginger, rosehip and cayenne to provide a gentle warming sensation. A great way to cool down and recover after an active day.Badger Organics Cooling Sore Muscle Rub bring relief to muscles where they hurt. Typically used for overexertion, arthritis, back aches, joint pain and stiffness. - Easy grip water bottle with built-in straw and see through lid. Staying hydrated is a key to healing and this water bottle is great to keep the body firing on all cylinders -- during recovery and once workouts begin again. - Soft, warming socks. These are wonderful for keeping feet warm when padding around home after an injury. - Assortment of healthy snacks, packed with protein for the active athlete. It's so handy to have healthy snacks on hand when needing a bite to take medication with or to satisfy a craving: some gourmet cashew and almond nut mixes, and an organic Bora Bora nut and seed bar. Low glycemic, kosher, low salt and delicious. - Your After Surgery Gift for the Athlete arrives gift wrapped in a reusable eco-friendly canvas tote bag. Recommended get well gift ideas for someone in the hospital. Help that special someone feel better soon with gifts that comfort, heal and show that you are thinking about them during their recovery.